A red, wooden telephone booth stands on a hill in Tahara, Aichi Prefecture, overlooking Mikawa Bay. Inside sits a disconnected black telephone. The booth was set up in June by a married couple who run a free school in the city as a spiritual way to connect with a student who took her own life in 2009 at age 18. 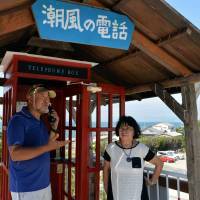 Tomohiko Kutsuna, 66, and his wife Kazuko, 69, named the booth Shiokaze no Denwa (phone of the sea breeze) after Kaze no Denwa (phone of the wind), a similar booth built on a hill in Otsuchi, Iwate Prefecture, that was hit by the 2011 earthquake and tsunami. The booth in Otsuchi, created by garden designer Itaru Sasaki in his garden overlooking the ocean, has attracted about 30,000 people from Japan and abroad seeking to “talk” to those they have lost. 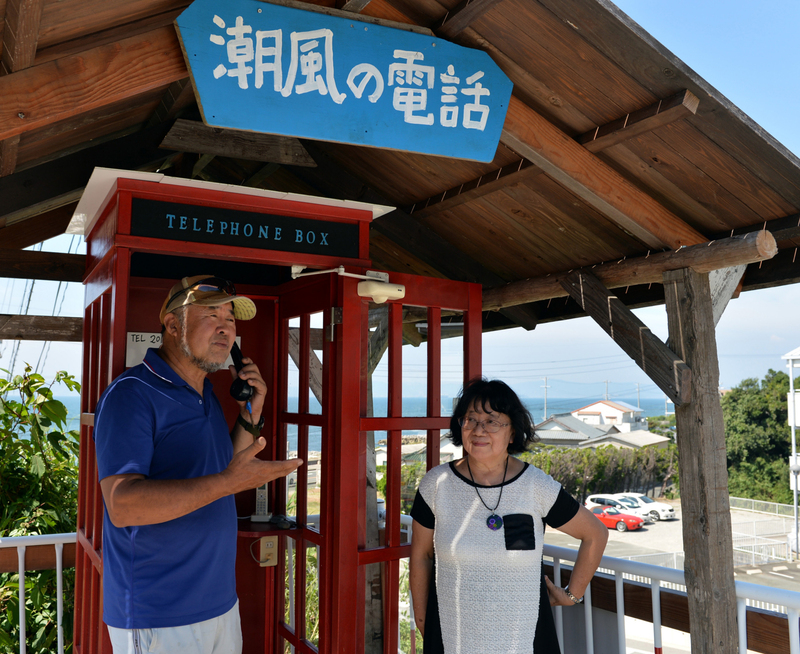 “We hope our telephone booth will also be used by people who lost their loved ones, just like us, in any way they want,” Tomohiko said. In 2001, Kazuko, a schoolteacher, had been concerned about the limits placed on children with diverse needs and abilities by the uniform education system. She quit her job and, along with Tomohiko, a painter, opened a free school called Yuzuriha Gakuen. Three years later, a girl from the prefecture, then a second-year junior high school student, started attending the free school. She had stopped going to classes when she was in elementary school because she did not get along with her teacher. She had difficulty sharing her feelings with others, and amid her struggle, she repeatedly attempted suicide, saying she couldn’t think of a reason to live. The couple continued to offer support, letting her stay at their house and giving counseling. But in January 2009, she took her own life at her home, leaving a note that said she would live if she failed to die this time. Kazuko said she considered closing the free school, but she decided not to because the girl’s parents asked her to keep going. The girl did not have a grave — due to her own preference expressed prior to her death — and the couple had a difficult time sorting out their feelings during the grieving process. This was when they learned about the telephone booth in Otsuchi. In June, nearly a decade after the girl’s death, the couple took possession of a telephone booth, gave it a fresh paint job and set it up on their school’s grounds. When they first picked up the telephone, they said they felt like they could understand the girl’s true feelings. They finally had peace of mind by creating a place to talk to her. Every now and then, they go into the booth and speak to the girl, sometimes apologizing for not having been able to save her. “I feel like she is always there,” Kazuko said, explaining that she was a kind girl who liked to bake bread. The couple has so far supported more than 3,000 parents and children through their school, looking out for children who ran away from home or exchanging messages with troubled parents. “We could continue our activities because of her. I never want such a sad thing to happen again,” Tomohiko said. This section features topics and issues from the Chubu region covered by the Chunichi Shimbun. The original article was published on Sept. 11.